"Women Of Fox Film Festival"
Doors open at 4pm; Pre-show entertainment at 5pm; movie at 5:30pm. Where a tuxedo or gown and get in for free! The festival's last selection is "Miracle on 34th Street" (1947). In this Christmas classic, an old man going by the name of Kris Kringle (Edmund Gwenn) fills in for an intoxicated Santa in Macy's annual Thanksgiving Day parade. Kringle proves to be such a hit that he is soon appearing regularly at the chain's main store in midtown Manhattan. When Kringle surprises customers and employees alike by claiming that he really is Santa Claus, it leads to a court case to determine his mental health and, more importantly, his authenticity. Features 8-year-old Natalie Wood’s breakthrough performance. Directed by George Seaton. 96 min. Shown on DVD with Spanish subtitles. Please click on a star rating for Screening of Miracle on 34th Street. 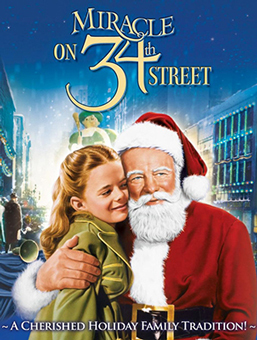 Please type your review for Screening of Miracle on 34th Street.